Google Reader Is Dead: What Technology Could Google Kill Next? Reader Is Dead: What Technology Could Google Kill Next & How Can You Protect Yourself? First they came for Buzz and no one cared. Then they came for Notebook. Now they’ve come for Reader. What technology will Google take away from you next? This article explains several Google technologies that might be next on the chopping block and what you can do to avoid getting Scroogled. 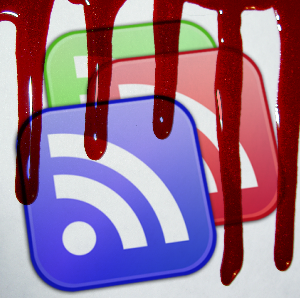 While Justin covered the replacements for Google Reader Google Reader's End Is Nigh: Prepare With These Alternative RSS Readers Google Reader's End Is Nigh: Prepare With These Alternative RSS Readers Google Reader is dead. By July the Internet's premier RSS service is shutting down forever, leaving users to find a replacement on their own. If you're looking for an equivalent to Google these are just... Read More , this article gives a roundup of alternatives to popular Google software that could possibly change for the worse in the near future. Google anticipated that they would eventually eliminate a number of its properties, so they created a backup option called Google Takeout. Takeout permits users to download an archive of data. Chris Hoffman explains in detail how to backup your data on Google How to Download & Back Up Your Gmail & Other Google Data How to Download & Back Up Your Gmail & Other Google Data We’re storing more and more data in the cloud these days. Email, contacts, documents, photos, calendar entries - you name it, it’s on Google’s servers. But what happens when the services we rely on go... Read More . Originally dubbed “Grandcentral” up until getting bought out by Google, Google Voice offers one of the most revolutionary experiences in the mobile marketplace. It can connect many different phones to a single phone line. It can also allow users to send text messages from a PC. Best of all, if properly configured, it functions as a completely-free Skype alternative. There’s been a series of rumors that Google Voice doesn’t have much time left as a free service. Consequently, it will behoove its users to know of potential fallback solutions, in a worst-case scenario. Unfortunately, it takes multiple apps to properly replicate the experience offered by Google Voice – and even then, some of Voice features don’t have an analog amongst other apps. Many of Voice’s features can be found in a combination of OpenVBX and Twilio. If you have any interest in building your own Voice alternative, Dave did an outstanding guide on the subject Hack Together The Ultimate Phone System With OpenVBX Hack Together The Ultimate Phone System With OpenVBX Read More . However, keep in mind that OpenVBX requires a great deal of setup. MightyText: I’ve used this app before and it’s quite good—unfortunately, Android only. Read Simon Slangen’s review and guide, here Send Text Messages From Your Browser With MightyText & MobiTexter [Android] Send Text Messages From Your Browser With MightyText & MobiTexter [Android] One of the main differences between a phone call, text message and messenger bird is the so-called deadline of reply. That's in an ideal world. In the real world, people forget their cellphones at home,... Read More . GroupMe: This app specializes in texting groups of people. Read Jessica Cam Wong’s review and rundown, here GroupMe Makes It Incredibly Simple To SMS Your Group Of Friends [U.S. Only] GroupMe Makes It Incredibly Simple To SMS Your Group Of Friends [U.S. Only] Email is slow, but texting two people the same message every time is also annoying. GroupMe, a group messaging app that has got clients for all major mobile platforms, and is just the right thing... Read More . Before Google Maps came to dominate the navigation app market, a variety of mapping software guided many a user. Most of these continued development, even after Google Maps expanded to its current towering height. Bing Maps: Remains one of the best alternatives. MakeUseOf covered its features extensively, particularly five awesome things 5 Cool Things You Can Do With Bing Maps Aerial View 5 Cool Things You Can Do With Bing Maps Aerial View Read More you can do with its aerial overhead view. In particular, Bing Maps provides a more detailed overhead view, better traffic cam integration and more accurate traffic hazard warnings. Gmail first opened to the public in 2007, spearheading Google’s first foray outside the domain of search technology. By 2012, it became the most used email provider in the world, gathering over 425 million users. While it’s highly doubtful that Google would ever shutter Gmail, many of its most useful features could get the axe. First and foremost, Gmail’s ability to make and receive phone calls over WiFi and, second, its ability to send and receive SMS for free. As mentioned above, SMS can be replaced by a huge number of apps. Google would never remove its core service, search, but it’s not outside the boundaries of reason to speculate that Mountainview may begin censoring its search results. Another possibility is that they could switch from the current free model to a subscription-based service. Google Shopping, for example, began charging vendors for the right to list items on its service. Alternatives to Google Shopping include Bing Shopping. Shopping: Both Microsoft Shopping [No Longer Available] and Yahoo Shopping offer reasonably well designed alternatives to Google’s service. Video Search: Believe it or not, Bing’s video search function compares favorably with Google’s. Not only does the service produce, in my experience, better results, it’s also faster. YouTube started out as a video sharing site. After Google acquired it in 2006, it rapidly spread across the globe. Today it is the third most visited site on the Internet. However, its evolution into an ad-choked wasteland of react clips may drive even the most banal of audiences to greener pastures. Dave covered five sites that could replace YouTube 5 Video Sites That Are Alternatives to YouTube 5 Video Sites That Are Alternatives to YouTube Believe it or not there was a time when YouTube wasn't the daddy of all online video sites. It was instead merely just one of a number that was offering ordinary people the chance to... Read More . A huge number of chat programs easily replace Google Talk. There was a discussion in the Answers section on the subject of which chat program offered the best overall performance – try reading it for a more detailed understanding of the software available. Also, Aaron wrote a great article on how to chat using only your browser Why You Don't Need Desktop Chat Clients Anymore Why You Don't Need Desktop Chat Clients Anymore Remember the days of MSN Messenger and AIM? Those two were the first chat clients I ever used. Once I started using them more and more, it became cumbersome to switch between clients and contact... Read More . Pidgin: My favorite all-in-one Combine All Your IM Accounts In One Application With Pidgin [Windows & Linux] Combine All Your IM Accounts In One Application With Pidgin [Windows & Linux] Pidgin is a free instant-messaging client that combines all your IM accounts in one simple application. Instead of running several different IM clients that display ads and eat up memory, just use Pidgin. All your... Read More chat app. It’s lightweight, open-source, highly customizable and easy to setup. Miranda: Another open-source chat client, Miranda offers lightweight, all-in-one chat. Trillian: A lot of users really seem to like Trillian for its all-in-one functionality and added social features, such as Facebook and Twitter compatibility. Sadly, even if Google+ went away, most people would fail to notice. Those that did notice, likely wouldn’t care. Aside from the huge number of alternatives, Google+ is dwarfed by Facebook and even MySpace. The services most likely to get canceled or go paid, according to some rumors, are Google Voice, because of its cost, and Google Talk, because it uses a desktop app. However, some of Google’s other services might alter in some unpalatable fashion in the near future. In such an event, having a backup plan in place will prove invaluable. Gmail will be integrated in Google Plus and more and more will Google urge / convince users to completely switch to a social network instead of "old style" emails. The valuable lesson is you can't totally rely on a webapp. Having backup service is a must and you must periodically export your data in case of abrupt closing. Howtogeek published a good article yesterday regarding this matter, which you can share to less savvy family members or friends. Google is quickly joining Microsoft as an Evil Empire. Yes, you can keep your settings. Go to Google Takeout,and select the Reader option. You will be able to download a file (XML or OPML, I forget which). Save the file to your desktop. Then, when you find a new reader (either a program or online), simply use that program to import those settings. Most RSS readers will be able to import that. I think that question is meant to be rhetorical. Other webapps may not provide similar 'takeout' option, therefore locking you out of your data once the service died. I have to say: I'm not even sure what Google Reader is. So, I'm thinking I won't be missing it. Noticable by its absence on this list is Blogger. I can imagine Google loosing interest as there hasn't been much in the way of evolution to the site since I first started using it about three years ago and it does seem to fall by the wayside when you consider WordPress and other similar services Blogger always seems to get a bum rap. I learnt HTML and CSS with Blogger years ago. I'm fond of that site though I always consider it to be 'fun' rather than WordPress' 'professional'. It's a solid product and I'd be sad to see it goes. I think the only thing that should disappear is Google. Not only because it is far from their original start ideology, but second it's just a tool to spy on people. But don't make the mistake to think, that that is only Google. Apparently Google has lost it's direction and is killing any program that some suit has decided is not profitable enough. This is an indication of MBA type thinking that has destroyed far too many American companies. (Profit NOW no matter what it costs in the future) This is going to come back and byte them as more people will be wary of any new Google initiative and will switch to other sources for their programs due to the fear that Google will kill something they like and use daily. Just how many BILLION dollars of profit do they really need? "Just how many BILLION dollars of profit do they really need?" You used the wrong verb. It should be "want", not "need". Have you tried Symbaloo? They recently revamped the interface (currently only available to existing members, but it'll be public soon). Re: Symbaloo - Thanks for the suggestion. But, not even similar to igoogle - looks like another click on the icon to be linked to the site - totally unlike the igoogle interface where a portion of the actual site is displayed right on the front page. - I don't have to click on the icon to see what is there - I see the headlines on the igoogle front page. I see a daily comic right on the igoogle page, I see my google calendar, along with the next half dozen flagged dates. My local weather is displayed - all without having to click on anything. There are a few types of views you can choose from. One is shortcut, then headlines, which as the name suggests, will shows list of headlines right on that page. I've heard and visit several sites touted as iGoogle replacement, but not one has similar feel. Though not an iGoogle user myself, I think I understand why people feel such a loss. Google is an internet behemoth.I think we should all have something in reserve for any of their services as anything and everything is subject to change or be dropped. I too lost faith on Google. Shame! The bottom line is every webapp will meet its demise at a point. Google isn't the only case, although it's arguably the most controversial. This is why I still prefer using offline applications. Anything that Google can't monetize will get the axe (or is liable). This is why it killed Google Desktop Search (giving us that line that they wanted to see all the info uploaded onto the cloud anyways); there were no ads with Reader so that went too. Gmail gives them SOME ad revenue (I don't know how much; I doubt its anywhere near what their search revenues are) so that is an unlikely victim. Google Books does have links to purchase the hard copy, so I'm sure that provides at least enough to keep going. Those are really the only Google services that I use enough to comment on. I think another possibility would be tasks with the release of google keep although I don't think it would be considered a total axe to tasks since basically keep does the same thing more or less. Skydrive by Microsoft has document editor, presentation creator, etc built in. It integrates with a lightweight version of Microsoft Office web apps the same way Google Drive/Docs does. They also have multiplatform syncing clients. 7GB of storage for new users or 25GB for old users.